mezzo rimango, lasso, et mezzo il varco. Poor Petrarch. In this sonnet he is wishing he could free himself from the obsession of his love, but he thinks that death would just put him into another war, from one grief to another. He begs Love, who has painted him with color, but doesn’t remember to come when he calls her. 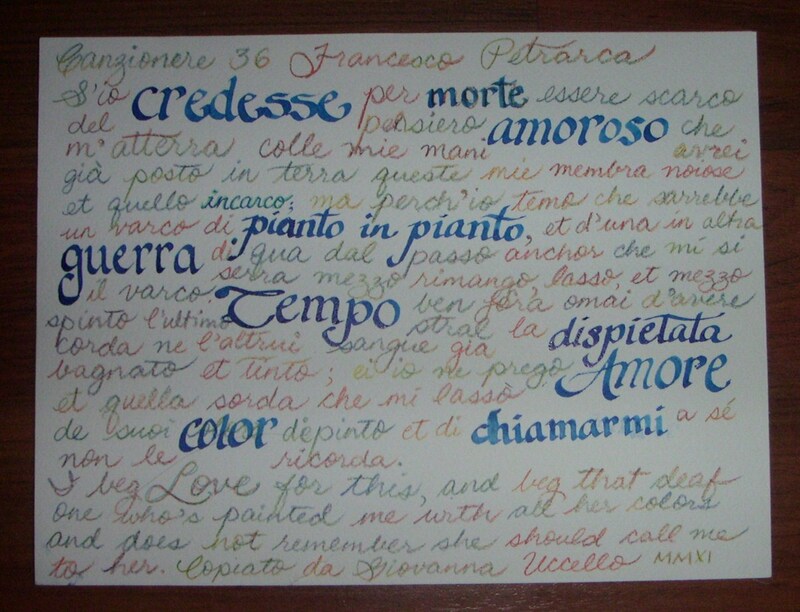 ..
Poor desperately obsessed Petrarch. Of course, even death was not an escape. He still suffered for another thirty years after Laure died. It wasn’t until the last decade of his life that his writings suggest he was released and could focus on worship of God and not his muse. I think that when I take the time to set this up for a good copy, with copy lines and borders, it will be quite effective. 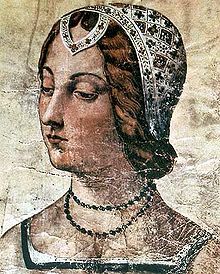 I particularly like my Italian pseudonym Giovanna Uccello. 😉 it’s fun having an easily transliterated name… Jeanne Oiseau. I mean, Shawn Bird. Last year after my husband and I spent a couple of weeks touring Italy, people would ask us what place we enjoyed the most, and we were unable to answer. Venice was, well, Venice: beautiful, spectacular, sad, interesting. We’d go back to explore more of her rabbit warrens in an instant. Cinque Terre, the five Mediterranean Sea coast towns, were picturesque, delightful and soothing. Rome was amazing for a hundred different reasons, and special because my fourth Finnish host family joined us there. Pompeii answered a childhood wish. Geneva (okay- that was a side-trip to Switzerland) was lovely, organized, expensive, and fascinating. Each was so different that there was no way to choose between them. Each was completely special in its own way. The Petrarch Museum in the white building on the right is believed to be on the site of Petrarch’s house. This year I found myself talking about one place whenever anyone asked us about our trip to France. Sure, Nice was nice. Yes, Avignon was intriguing. Paris was bustling and full of things to see. The star of our visit was a small village that most people have never heard of. Somewhere around 1310 Francesco Petrarca, his father and his brother made a visit to the source of the Sorgue River. It had been known for centuries as a miracle of nature. There was a hole at the bottom of a limestone cliff, a still pool, and then a raging river. Greeks and Romans had come to marvel at it in their time. 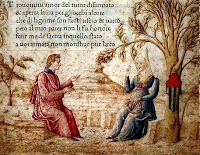 Petrarca was a boy, but he declared that this was a place he wanted to live. Some twenty years later, he bought property and spent fifteen contented years off and on living in his house on the banks of the Sorgue, trying to forget Laure, writing, and tending his books and his gardens: one at his house and another by the still pool of the spring at Fontaine de Vaucluse. There is a magic in this place. The incongruity of the stillness and the noise. The contrast of the white cliffs and greenery. The fortress on the top of the hill that was in ruins even in Petrarca’s time. The sound of the newly born river which seems to burrow into your head and erase all hurry. The meditative nature of the place. I could never have described it from the photographs. This is one place that one has to visit to fully appreciate. I wish I’d had more time to just soak in the atmosphere of the place. And so we were. 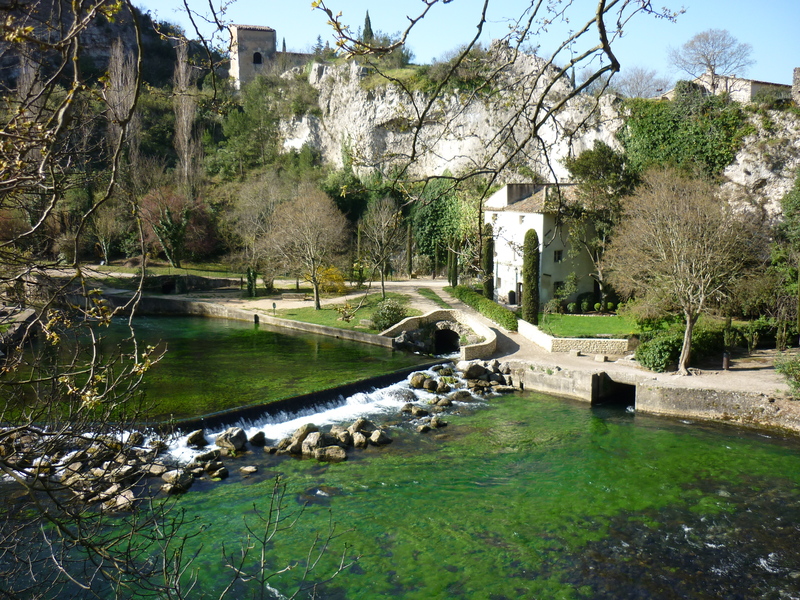 If Francesco Petrarca had not been writing about Fontaine de Vaucluse in the 14th century, I would never have known about it and I would never have sought the experience. I would never have found myself sitting by the river bank as the sound of the Sorgue carried me back seven centuries. He was pompous, but he was right. His words are entwined in the magic of the place.